CTET Notification 2017, CTET February 2017 Application form, Exam date - ctet.nic.in - Central Teacher Eligibility Test (CTET) is conducted every year two times. February 2017 notification will be released by Central Board of Secondary Education, Delhi in December 2016. The Central Board of Secondary Education, Delhi is likely to be conducting the Central Teacher Eligibility Test (CTET) on 19.02.2017 (Sunday) for candidates to be eligible for appointment as teacher for Class I to VIII. Candidates can apply On-line for CTET-Feb 2017 through CTET official website - www.ctet.nic.in only. Interested and eligible candidates can apply for it from December to January 2017. The written examination is to be conducted on 19 February 2017 in 2 shifts. Candidates can apply online for CTET Exam Notification 2017 from here or on the official website. All the important details of the notification with pdf is provided here. Central Board of Secondary Education (CBSE), Delhi will conduct Central Teacher Eligibility Test 2017 for determining a candidate's eligibility for appointment as a teacher for classes I to VIII in the month of February. The application can only be filled via Online mode on official website. Here are some of the important details of the notification. CTET February 2017 Application form link will be activated in December 2016. CTET Feb 2017 Notification is to be available from December 2016. 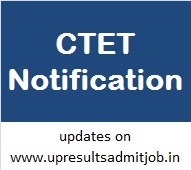 Download CTET 2017 Notification - Click here to download Notification in English- to be released in Dec 2016. CTET Feb 2017 Notification release date: December 2016. CTET Feb 2017 Exam Date : likely on 19 February 2017 (Sunday). Test Duration for written test is 2 hours 30 Minutes. Eligibility: Check notification pdf for details on this. Application fee can be submitted through challan in syndicate bank or through online mode by using debit/credit card. i The CTET shall apply to schools of the Central Government (KVS, NVS, Tibetan Schools, etc) and schools under the Administrative Control of UT of Chandigarh, Andaman & Nicobar Islands, Lakshadweep, Daman & Diu, Dadra & Nagar Haveli and NCT of Delhi. ii CTET may also apply to the unaided private schools, who may exercise the option of considering the CTET. iii Schools owned and managed by the State Government/local bodies and aided schools shall consider the TET conducted by the State Government. However, a State Government can also consider the CTET if it decides not to conduct the State TET. CTET Feb 2017 affiliated to the CBSE shall qualify/pass the Central Teacher Eligibility Test or Teacher Eligibility Test (TET). The candidates having the following minimum educational qualification are eligible for appearing in CTET. Minimum Educational Qualifications for becoming Teacher for Classes I-V (Primary Stage) Senior Secondary (or its equivalent) with at least 50% marks and passed or appearing in final year of 2- year Diploma in Elementary Education (by whatever name known). Senior Secondary (or its equivalent) with at least 45% marks and passed or appearing in final year of 2-year Diploma in Elementary Education (by whatever name known), in accordance with the NCTE (Recognition Norms and Procedure), Regulations, 2002. Senior Secondary (or its equivalent) with at least 50% marks and passed or appearing in final year of 4-year Bachelor of Elementary Education (B.El.Ed). Senior Secondary (or its equivalent) with at least 50% marks and passed or appearing in final year of 2-year Diploma in Education (Special Education)*. Graduation and passed or appearing in final year of two year Diploma in Elementary Education. Graduation with at least 45% marks and passed or appearing in 1-year Bachelor in Education (B.Ed), in accordance with the NCTE. Senior Secondary (or its equivalent) with at least 50% marks and passed or appearing in final year of 4-year Bachelor in Elementary Education (B.El.Ed). Senior Secondary (or its equivalent) with at least 50% marks and passed or appearing in final year of 4-year B.A/B.Sc.Ed or B.A. Ed/B.Sc.Ed. Graduation with at least 50% marks and passed or appearing in 1-year B.Ed. (Special Education). Relaxation up to 5% in the qualifying marks in the minimum Educational Qualification for eligibility shall be allowed to the candidates belonging to reserved categories, such as SC/ST/OBC/Differently abled. Candidates who are appearing in the final year of Bachelor Degree in Education or Diploma in Elementary Education etc. are provisionally admitted and their CTET Certificate shall be valid only on passing the aforesaid Examinations, before the declaration of the CTET result. The CTET examination will be of objective type Multiple Choice Question (MCQs). There will be no negative marking. There will be 2 papers of CTET. (i) Paper I will be for a person who intends to be a teacher for classes I to V.
(ii) Paper II will be for a person who intends to be a teacher for classes VI to VIII. Online Application for CTET 2017 has to be submitted by accessing the following CTET website ctet.nic.in. The candidate should supply all the details while filling up the ‘On-line’ Application. After depositing fee in Bank, Candidates are required to take a print out of the computer generated Confirmation Page after successful submission of data. (if fees paid through Challan) and keep it for records and future reference if required.